NOTE: This report was originally written by Ceir Coral while he was an Air Force Fellow at the Congressional Research Service. Since his departure, it has been maintained by Jeremiah Gertler of CRS. On September 27, 2018, the United States Air Force (USAF) awarded The Boeing Company a contract, worth up to $9.2 billion, to procure 351 Advanced Pilot Training (APT T-X) aircraft and 46 Ground-Based Training Systems (GBTS) to replace the existing fleet of T-38C jet trainers. The Air Force had originally valued the contract at roughly $19.7 billion. Information on the value of other competitors’ bids was not available. The FY2019 Administration budget request included $265.465 million for the T-X. According to the USAF, the T-38C trainer fleet is old, costly, and outdated, and lacks the technology to train future pilots for fifth-generation fighter and bomber operations. Based on Air Education Training Command’s evaluation of the required capabilities to train future pilots for fifth-generation fighters and bombers, the T-38C falls short in 12 of 18 capabilities, forcing the USAF to train for those capabilities in operational units where flying hours are costly and can affect fleet readiness. Based on the requirements set forth in the USAF’s RFP, the APT T-X aircraft may shift training from Field Training Units, where expensive fifth-generation aircraft are used, to less expensive trainer aircraft. Also, the higher fidelity GBTS could improve training for student pilots and move many tasks from aerial flight training into simulators. The APT T-X acquisition strategy poses potential oversight issues for Congress, including the following: Is the number of planned aircraft purchases sufficient? Given the reported Air Force pilot shortage, should the procurement be accelerated? What effects do increased F-35A and KC-46 purchases, along with development of the new Long Range Strike Bomber, B-21, have on the USAF budget and the feasibility of an additional Major Defense Acquisition Program? Given that the winning bid was roughly half the expected cost, can the contract be carried out on time and on budget? NOTE: This report was originally written by [author name scrubbed] while he was an Air Force Fellow at the Congressional Research Service. Since his departure, it has been maintained by [author name scrubbed] of CRS. On September 27, 2018, the United States Air Force (USAF) awarded The Boeing Company a contract, worth up to $9.2 billion, to procure 351 Advanced Pilot Training (APT T-X) aircraft and 46 Ground-Based Training Systems (GBTS) to replace the existing fleet of T-38C jet trainers. The Air Force had originally valued the contract at roughly $19.7 billion. Information on the value of other competitors' bids was not available. According to the USAF, the T-38C trainer fleet is old, costly, and outdated, and lacks the technology to train future pilots for fifth-generation fighter and bomber operations. Based on Air Education Training Command's evaluation of the required capabilities to train future pilots for fifth-generation fighters and bombers, the T-38C falls short in 12 of 18 capabilities, forcing the USAF to train for those capabilities in operational units where flying hours are costly and can affect fleet readiness. Based on the requirements set forth in the USAF's RFP, the APT T-X aircraft may shift training from Field Training Units, where expensive fifth-generation aircraft are used, to less expensive trainer aircraft. Also, the higher fidelity GBTS could improve training for student pilots and move many tasks from aerial flight training into simulators. The APT T-X acquisition strategy poses potential oversight issues for Congress. The addition of a new Major Defense Acquisition Program as the Air Force continues to purchase F-35As and KC-46s and develop the new Long Range Strike Bomber, B-21, will affect the USAF budget requests going forward, and the T-X contract award has already been delayed several times in light of budget issues. Specific to the APT T-X acquisition, Congress may wish to consider the correct number of trainer aircraft and ground-based training systems along with timing of their procurement and fielding. The current U.S. Air Force (USAF) pilot trainer aircraft fleet consists mainly of the T-6 Texan II, T-1A Jayhawk, and the T-38 Talon. Pilot candidates will generally begin in the T-6, moving to the other aircraft depending on the type of aircraft (fighter, cargo, etc.) to which they will ultimately be assigned. Source: HQ AETC/A5RX Email dated December 6, 2016. Note: AETC maintains other trainer aircraft in addition to T-1, T-6, and T-38; however, these three models comprise almost 80% of the trainer fleet. The T-6 Texan II trainer aircraft is a single-engine, two-seat, turboprop aircraft designed to train student pilots in basic flying skills common to both USAF and U.S. Navy (USN) pilots in Joint Primary Pilot Training. A military version of the Beech/Pilatus PC-9 Mk II, the T-6 was originally manufactured by Raytheon Aircraft, later Beechcraft. The USAF acquired the T-6 in May 2000 and began training with it that same year. In 2001, the USAF and USN began using the T-6 as the primary trainer in the Joint Primary Pilot Training program at Moody AFB, GA. The aircraft has tandem seating (one pilot behind the other) with interchangeable instructor/student seating. The aircraft features a pressurized cockpit, an anti-G force system, an advanced avionics package, ejection seats, and fully aerobatic flight controls.2 The T-6A is the aircraft portion of the Joint Primary Aircraft Training System (JPATS), and is currently in use at Columbus AFB, Mississippi; Vance AFB, Oklahoma; and Laughlin AFB and Sheppard AFB in Texas. The JPATS acquisition program is a system-of-systems for primary flight-training devices to meet USAF and USN initial pilot training requirements. The principle JPATS mission is to train entry-level student pilots in primary flying skills to a proficiency level that will allow them to transition to advanced pilot training tracks. The program was initiated in 1994 and designed to replace the USAF T-37B and USN T-34C aircraft and associated ground-based training systems. The JPATS program consisted of the T-6 Texan II aircraft, simulators, ground-based training devices, a Training Integration Management System, instructional courseware, and contractor logistics support. The original JPATS program called for production of 452 T-6A aircraft for the USAF and 249 for the USN. Raytheon was awarded the acquisition and support contract in 1996. The Training Integration Management System is a computer-driven system used to manage student progress through the Joint Primary Pilot Training program. It contains all the academic modules, tracks student events and grades, performs aircraft scheduling, and assists in overall training management. Source: http://www.dote.osd.mil/pub/reports/FY1999/pdf/af/99jpats.pdf, http://www.dote.osd.mil/pub/reports/FY2007/pdf/navy/2007jpats.pdf, and http://slideplayer.com/slide/9358758/. The T-1A Jayhawk is a medium-range, twin-engine jet used in the advanced phases of Specialized Undergraduate Pilot Training (SUPT). Students selected to become airlift or tanker aircraft pilots will train in the T-1A after completing Undergraduate Pilot Training. The T-1A was manufactured by Raytheon, later Hawker Beechcraft, and derived from the commercial Beechjet 400A aircraft.3 The USAF first acquired the jet in 1992 and students began using the aircraft for training in 1993.4 The main differences between the military aircraft and civilian version are structural enhancements for bird strike resistance and an additional fuel tank. The cockpit is configured to support an instructor pilot and two student pilots. The T-1A is currently used for pilot training at Columbus AFB, Mississippi; Laughlin AFB, Texas; Vance AFB, Oklahoma; and Randolph AFB, Texas; and for combat systems officer training at Naval Air Station Pensacola, FL. What Are Capability Requirement Documents? Initial Capabilities Document (ICD)—Capability requirements, with significant capability gaps, documented in an ICD can lead to development of capability solutions. These solutions can be materiel, nonmateriel, or a combination of both. Capability Development Document (CDD)—Capability requirement document that is tailored toward a particular materiel solution to capability gaps. The stated mission of the APT T-X system is to prepare student pilots to operate fourth- and fifth-generation fighters and bombers. The USAF plans to integrate the APT T-X within the advanced phase of the fighter/bomber track of SUPT as well as IFF. The scope of the acquisition program is to acquire an advanced trainer aircraft and ground-based training system to be used by the Air Education and Training Command (AETC) in the pilot training pipeline.15 The purpose of the trainer aircraft is to bridge the UPT primary phase in the T-6 Texan and fifth-generation Formal Training Unit (FTU) aircraft. The APT T-X is comprised of multiple systems working together to enable advanced pilot training. The major components include the aircraft, ground-based training systems, virtual training systems, electronic classrooms, aircraft maintainers (personnel), maintenance training systems, and support infrastructure. Figure 5 provides a high-level graphical view of the APT mission and associated architecture capabilities. Source: Advanced Pilot Training (APT T-X) Concept of Operations, Air Education and Training Command, Directorate of Plans, Programs, Requirements and Assessments. Note: The Operational View shows the interdependencies with support services such as air traffic control, as well as the interoperability between the ground-based training systems. The APT T-X System Specifications (see Appendix D) detail the specific system requirements for the new trainer aircraft to meet the USAF's 18 identified mission tasks. The USAF's December 30, 2016, final RFP solicitation includes the system specification document. Joint Base San Antonio-Randolph, Texas (IFF/Pilot Instructor Training). OFTs provide a networked simulator capability to train more advanced flight profiles and IFF course tasks. The OFT provides a greater training capability than the UTD, enabling visual flight patterns and landings, basic formation flying, and low-level operations.26 The ability to link the OFT simulators provides the capability to train formation flying in a virtual battlespace. The WST is also a linked simulator network similar to the OFT. In addition to OFT capabilities, the WST's greater field-of-view capability allows students to train in basic fighter maneuvers. WSTs are critical to training fighter formation flight and tactical maneuvering. According to the USAF, a high-fidelity GBTS that can replicate advanced sensors as well as actual aircraft handling characteristics will enable more accurate simulated flying training to facilitate more offloaded training (training moved from an aircraft into a simulator). The desire to evolve simulator training from traditional stick-and-throttle flying to sensor-driven tactics is a direct result of fifth-generation fighter capabilities such as advanced data links, multispectral sensor fusion, and Advanced Cockpit/Crew Resource Management.28 The level of performance provided by the GBTS will be a driving factor in determining how much training can be offloaded into the simulator. The statement of work (SOW) associated with the APT solicitation includes all engineering and manufacturing development (EMD), production, and sustainment activities. In addition, the SOW calls for Field Service Representatives and Interim Contractor Support for the APT aircraft in support of transitioning to a government organic supply chain management and maintenance concept. The GBTS devices will be supported by a contractor logistics support contract. The acquisition strategy calls for mature, demonstrated technologies as opposed to a new, developmental system, although it should be noted that the winning Boeing design falls into the latter category. The EMD portion of the contract will be limited and focused on developmental work to incorporate capabilities to meet the system specifications. The current program schedule projects initial operational capability in FY2024. Some analysts argued that the fixed-price elements of the contract placed new designs at a disadvantage compared with vendors offering a modified existing platform.37 This is based on the fact that the vendor offering a new design must invest corporate funds to cover design costs. Other analysts argued that the decision to offer a new design is a corporate business decision and not a requirement; therefore, the risk and investment was purely a business consideration when deciding to compete for the contract award. According to the USAF APT solicitation, the competition was a best value source selection conducted in accordance with Federal Acquisition Regulation Part 15, Contracting by Negotiation,38 with the contract awarded to the offeror whose proposal is determined to offer the best value to the government based on an assessment of evaluation factors and subfactors identified in the solicitation's Section M—Evaluation Factors for Award. According to the USAF, lessons learned from the KC-X source selection were incorporated into the source selection strategy employed for the APT competition.39 Figure 6 represents the evaluation factors and subfactors that were to be used to evaluate offeror proposals. Based on the evaluation plan, an offeror's proposal must be less than $16.3 billion in order to be evaluated. This is the first measure for a proposal to be considered as a viable offer. This gate is considered an affordability measure based on the USAF program office estimate. According to the USAF solicitation, in order for a proposal to be considered awardable, offerors must meet the affordability gate,40 and receive a Low or Moderate technical risk rating for Subfactors 1.1-1.5, as well as an Acceptable rating for Subfactors 1.6-1.7. Also, if any nonprice factor or subfactor was evaluated as High or Unacceptable, the entire proposal would be ineligible for award.41 The offerors were to meet all standard government solicitation requirements (e.g., compliance with terms and conditions, intellectual property assertions, cost and data requirements, and security compliance). Each subfactor was to be evaluated individually and assessed based on detailed criteria found in Section M of the solicitation. Source: Solicitation FA8617-17-6219, Section J – Attachment 18, Section M – Evaluation Factors for Award. Notes: Value Adjusted Total Evaluated Price (VATEP). For a greater explanation of each subfactor and evaluation criteria see Solicitation FA8617-17-6219, Section J–Attachment 18, Section M–Evaluation Factors for Award. Five aerospace company partnerships voiced intent to compete for the APT contract. Details of each partnership's offering are limited due to the nature of contract competitions; however, some marketing information has surfaced in anticipation of the APT solicitation. The following section will identify the prospective offerors and their intended product offerings. In December 2013, Boeing and Saab formed a partnership to develop a purpose-built trainer in anticipation of the USAF APT program. The single-engine, twin-tail, stadium seating trainer was unveiled on September 13, 2016, at Boeing's St. Louis, MO, facility. According to Boeing, the T-X (see Figure 7) is a production aircraft and not a prototype. As of December 2016, two T-X aircraft had already flown maiden flights.44 Boeing claims the purpose-built trainer was designed from the ground up to include the Ground-Based Training System and support. Parts of the aircraft were manufactured in Sweden and final assembly took place in St. Louis, MO.45 Boeing has not announced where the aircraft will be built should they win the contract. Note: According to the Boeing website, this picture was taken during T-X's second flight. In late 2011, Northrop Grumman and BAE Systems announced they would offer the single-engine BAE Hawk as the replacement bid for the T-38C. However, in 2014 the companies announced that they would offer a new purpose-built jet trainer system.46 According to Northrop executives, the new design would better meet the USAF requirements than the Hawk offering. The partnership with BAE Systems and L-3 would combine ground-based training systems and training devices to form a complete training system. Source: Lockheed Martin from Janes Defence Weekly article. Notes: First flight of the T-50A by Lockheed Martin. 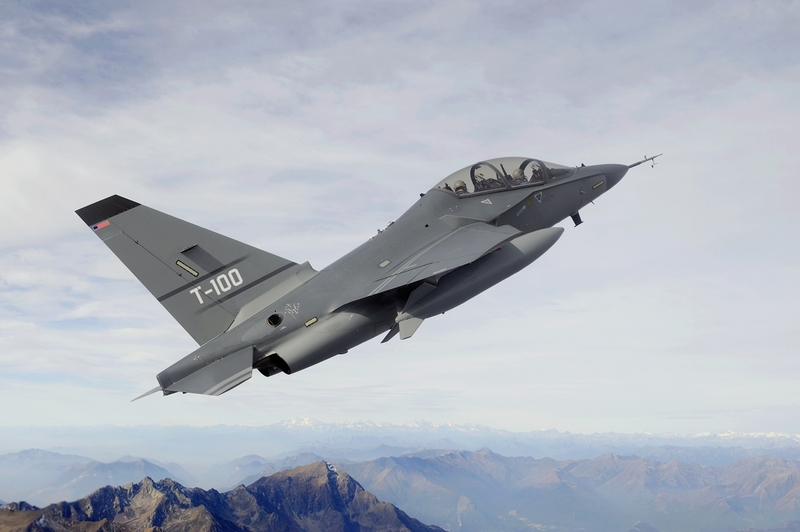 The T-100 (see Figure 10) is a variant of the M-346 trainer that is currently in use in Italy, Israel, Poland, and Singapore.52 If chosen, Leonardo says the T-100 will be built at a new facility in Tuskegee, AL. Leonardo had originally partnered with General Dynamics and then with Raytheon to offer the T-100.53 In February, 2017, Leonardo announced plans to enter the competition on its own with its U.S. subsidiary DRS as the prime contractor. Notes: The T-100 is a variant of the Leonardo M-346. Leonardo has been previously known as Finmeccanica and Alenia Aermacchi. An offering from Sierra Nevada Corp. and Turkish Aerospace Industries was announced as a late entrant into the T-X competition. According to Aviation Week, "the two businesses have quietly set up shop in Centennial, Colorado, as Freedom Aircraft Ventures LLC, to develop a lightweight, all-composite trainer. "54 Additional information on this offering has not been released, and the team is not known to have submitted a bid. Given the USAF's position on the looming pilot shortage, the anticipated purchase of 350 T-X aircraft, and the current fleet size of 430, what are the minimum and optimum recapitalization levels needed? Should the number of new aircraft increase, would a corresponding increase in GBTS be appropriate? Is there an opportunity to consolidate the USAF's five pilot training locations into fewer bases? Is a study warranted at this time to further consolidate pilot training? Given the ramp-up in F-35A purchases, additional KC-46 lots, and development of the B-21 bomber, what is the impact of a fourth major defense acquisition program to the USAF budget? Should the training fleet be recapitalized sooner to accommodate the increase in the number of fifth-generation platforms? What, if any, acquisition reform initiatives need to be in place to facilitate faster procurement of the T-X? Should the USAF consider the selected T-X platform, with modification, as a light-attack fighter to take advantage of the fifth-generation capabilities required in the T-X system? Considering that the winning bid was less than 50% of the Air Force's projected cost, can Boeing execute the program on time and within budget? How Does the USAF Produce Pilots? The USAF uses a deliberate, competitive process to select pilot candidates. Once chosen, candidates undergo a lengthy academic and flight training program. Doss Aviation operates Diamond DA20-C1 aircraft (see Figure A-1) to execute the IFT program. Pilots selected to fly fighter aircraft attend the Introduction to Fighter Fundamentals (IFF) course at Sheppard AFB, Texas. There are 15 ENJJPT IFF classes per year, and the course lasts approximately eight weeks. Following IFF, the pilots transition to training on their assigned aircraft at bases throughout the United States, depending on aircraft assignment. Table A-1 identifies the respective aircraft and training base. Notes: Pilots may be assigned as a First Assignment Instructor Pilot (FAIP) in the T-38. FAIPs selected for ENJJPT will only be assigned to instruct at ENJJPT and attend Pilot Instructor Training at ENJJPT. In addition to academic classes and flight instruction, students are also required to train in aircraft simulators to apply learned techniques and to be prepared for the cockpit. Experts agree that simulators provide a cost-effective means of instruction to help reduce the burden and cost of aircraft operations and maintenance. Also, simulators allow instructors to introduce a variety of emergency conditions that pilots may confront during flight operations in a safe and controlled environment. The emergency simulations are critical to enhance the student pilot's awareness and skills in preparation for encountering similar emergencies in flight. current Air Force live flight/simulator training balance varies from pipeline to pipeline. Primary training that all USAF pilots go through in the T-6 Texan II demonstrates the current emphasis on live flight. The division between live flight and simulation events is 65 percent/35 percent. That equates to about 87 hours in the aircraft and 46 hours in the simulator. For the airlift/mobility pipeline where students fly the T-1 Jayhawk, the current balance is similar, 71 percent of events occurring in the aircraft and 29 percent in the simulator. This will shortly change, however. The USAF is working its way through a "tech refresh" of its T-1 simulation devices, which will grow significantly in capability. With T-1 flight training total time scheduled to drop to 130 hours, the pipeline will move toward a 60/40 percent live flight/simulator split by 2013.78 This represents 76.5 hours of aircraft time and 53.5 hours of simulator time. the Navy as of 2012 was using simulators for 18-20% of Boeing F/A-18 Hornet training, 39% of Romeo training and 41% for Sikorsky MH-60 Sierra training. The Navy uses the Romeo primarily for anti-submarine warfare and anti-surface warfare missions, while the Sierra is used primarily for search and rescue, medevac, utility and vertical replenishment missions. With upgraded MH-60 Romeo and Sierra, F/A-18E and F, and EA-18G TOFTs [Tactical Operational Flight Trainer], however, the Navy estimates it will be able to boost the virtual training ratio to approximately 50% for the MH-60 fleet, and more than 30% for the F-18s by 2020. Capt. Craig Dorrans, program manager of PMA-205 at the Naval Air Systems Command says crews for the Boeing P-8A Poseidon, the replacement for the P-3, will probably be able to perform as much as 70% of their training in a TOFT. The P-8A is based on the Boeing 737-800, allowing the military to leverage commercial simulation capabilities already developed. The FY2018 Administration budget request included $105.999 million for the Advanced Pilot training program. Congress authorized the full amount in the FY2018 National Defense Authorization Act (H.R. 2810). In Division C of the FY2018 Consolidated Omnibus Appropriations Act (H.R. 1625), Congress appropriated the Advanced Pilot Training program $86.199 million, a reduction of $19.8 million, citing "contract award delay." The Administration's proposed FY2017 defense budget requested $12.377 million in Air Force research and development funding to continue APT T-X development and acquisition.85 Table 2 represents the USAF's portion of the Future Years Defense Program (FYDP) submission dedicated to the T-X and the $12.377 million requested budget for FY2017. Source: Air Force FY2017 Budget Materials submitted to the DOD, http://www.saffm.hq.af.mil/Portals/84/documents/FY17/AFD-160208-051.pdf?ver=2016-08-24-102123-043. Notes: This represents only the Research, Development, Test and Evaluation budget. Procurement, MILCON, and Operations & Maintenance budget requirements will start in FY2020. The Administration's FY2017 budget request included $12.377 million for the Advanced Pilot Training program. The House Armed Services Committee, in its report accompanying H.R. 4909, recommended funding the Advanced Pilot Training program at $12.377 million, the requested level. The Senate Armed Services Committee, in its report accompanying S. 2943, recommended funding the Advanced Pilot Training program at $4.477 million, $7.9 million below the requested level, finding that the funds were early to need given the current contract award schedule. The conference report accompanying H.R. 4909, as passed, recommended $7.377 million, a reduction of $5 million from the Administration's request, finding the funds were early to need. Division C of the FY2017 Consolidated Appropriations Act (H.R. 244) appropriated $7.377 million for the Advanced Pilot Training program, reducing the requested amount by $5.0 million as "early to need." The House Armed Services Committee and Senate Armed Services Committee both recommended funding the Advanced Pilot Training program at $11.395 million, the requested level. The House Appropriations Committee recommended funding the Advanced Pilot Training program at $10.395 million, a reduction of $1 million from the Administration's request, with no accompanying language. The Senate Appropriations Committee recommended funding the Advanced Pilot Training program at the Administration's request, $11.395 million. H.Rept. 114-139 accompanying H.R. 2685 funded the Advance Pilot Training program at $10.395 million, a reduction of $1 million from the Administration's request. H.Rept. 113-473 and S.Rept. 113-211 accompanying H.R. 4870 funded the Advance Pilot Training program at $8.201 million, the Administration's requested level.87 FY2015 was the first year of funding to execute the program. Basic aircraft control is the ability to operate the aircraft throughout the flight envelope within the course training standards. This includes advanced handling (e.g., aerobatics, high angle-of-attack [AOA] flight, high-speed flight and high-G awareness exercises). The T-38 Family of Systems (FoS) does an adequate job in basic aerobatics and basic aircraft control cognitive development. The basic aircraft control skill sets learned in an APT configured with the T-38 FoS will not readily transfer to the 5th-generation aircraft Formal Training Unit (FTU). The T-38 FoS cannot replicate the fly-by-wire aircraft feel and other 4th- and 5th-generation performance such as high-AOA maneuvering, high-altitude maneuvering, and higher thrust-to-weight ratios. The T-38C life support systems are also not representative of 5th-generation systems (oxygen, pressure breathing for G, etc.). Emergency Procedures means the ability to perform emergency operating procedures within the course training standards. From a procedural perspective, the T-38 FoS does an adequate job enabling this task. The basic tenets for handling emergencies are aircraft independent: maintain aircraft control; analyze the situation and take proper action; and land as soon as conditions permit. Nonetheless, each aircraft has unique procedures for dealing with emergencies. The 5th-generation aircraft will have more computer-controlled systems with emergencies diagnosed and manipulated via these computer systems. Also, the F-35 is a single-engine aircraft. Engine out emergency training is more challenging without an instructor in the same aircraft. Operational Availability means the ability to provide systems for operational needs. Operational Availability consists of three components: reliability, maintainability, and supportability. Although the current figures are positive, the T- 38 FoS is beginning to show its age. The increasing non-mission-capable maintenance (NMCM) rate and cannibalization actions reflect areas of concern. There are issues with engines, airframes, landing gear, and avionics. may affect Operational Availability, as well as the cost per flying hour. The T-38 FoS does an adequate job enabling this task. Moreover, the T-38's high airspeed enhances the pilot's cognitive decision cycle development. Nonetheless, the limitations borne from a lack of 4th- and 5th-generation aircraft capabilities in the T-38 FoS affect portions of this area. First-time landings in the F-35 will be challenging. Advanced CRM means the ability to prioritize mission tasks and operate on-board sensors and systems for maximum situational awareness and mission effectiveness. Advanced systems include hands-on throttle and stick (HOTAS). The T-38 FoS lacks the necessary 4th- and 5th-generation aircraft systems for adequate Advanced CRM training. The T-38 FoS has no radar, sensors, or data-link capability. Advanced A/A Mission Employment means the ability to perform advanced A/A mission employment within the course training standards. Advanced A/A mission employment supports the introduction of tactical A/A mission employment fundamentals to include tactical offensive and defensive maneuvering as it applies to air-to-air (e.g., Air Combat Maneuvering [ACM], Air Combat Training [ACT]) operational combat tactics; low altitude employment challenges and hazards (e.g., Low Altitude Training [LOWAT]); night vision device employment; and air refueling operations. The T-38 FoS lacks the necessary performance, cockpit visibility, avionics, and sensors for 4th- and 5th-generation aircraft familiarization training in Advanced A/A Mission Employment. The T-38 FoS has no air refueling capability. Support Infrastructure means providing infrastructure to support effective and efficient training operations. This task includes base facilities (e.g., academic classrooms, briefing rooms, runway, air traffic control, etc.). It also includes training airspace and compliance with operational environmental policies (e.g., noise abatement, restricted over-flight, etc.). USAF foresees airspace and range access challenges. Recent examples (Luke AFB, NAS Oceana, and Nellis AFB) suggest airfield encroachment will continue to be an issue. Moreover, commercial air operations may further erode access to training airspace and training ranges. Instruments/Navigation means the ability to perform instrument/navigation procedures within the course training standards and AFMAN 11-217. Although the T-38 FoS does an adequate job enabling basic Instruments/Navigation, the trend away from "radio-type" navigation to the National Airspace Structure use of Global Positioning System (GPS) and micro-wave capabilities creates limitations. Also, the T-38C anti-ice deficiencies and high density altitude takeoff and landing limitations inhibit all-weather training. Formation means the ability to perform formation flight within the course training standards; this supports the performance of two-/four-ship operations from briefing to debriefing as a wingman and lead. Although the T-38C aircraft does an adequate job enabling basic formation, it is deficient in enabling autonomous formation operations. These operations include night, all-weather, and beyond-visual-range formation activities. The T-38 FoS lacks lighting, radar, data-link, and Night Vision Goggle (NVG) systems. Also, the T-38 simulators lack the visual clarity necessary to enhance advanced formation activities. Basic A/A Mission Employment means the ability to perform basic A/A mission employment within the course training standards. Basic A/A mission employment supports the introduction of basic A/A mission employment fundamentals to include basic offensive and defensive maneuvering (e.g., Basic Fighter Maneuvers [BFM], sustained high-G maneuvering), as well as low-altitude navigation environment challenges and hazards (e.g., Low Altitude Step Down Training [LASDT]). Although the T-38 FoS does a reasonable job enabling BFM skills development using classic offensive and defensive maneuvers, the lack of sustained high-G capability and 5th-generation fly-by-wire and computer-aided maneuvering capabilities limits the T-38 FoS BFM relevance and applicability in comparison to 5th-generation aircraft. Also, the T-38 FoS lack of sensors, data-link, and automation constrains the development of this task. Advanced A/G Mission Employment is the ability to perform advanced A/G mission employment within the course training standards. Advanced A/G mission employment supports the introduction of tactical A/G mission employment fundamentals to include A/G (e.g., Surface Attack [SAT], Close Air Support [CAS]) operational combat tactics; low altitude employment challenges; and hazards and night vision device employment. The T-38 FoS lacks the necessary performance, avionics and sensors for 4th- and 5th-generation aircraft familiarization training in Advanced A/G Mission Employment. The T-38 FoS has no capability to enable training with advanced weapons such as J-series, laser guided, and data-link versions. Pilot Throughput means the ability to provide the capacity to graduate Headquarters USAF-tasked numbers of pilots on-time. Pilot throughput is a force structure issue independent of the FoS's capabilities. The objective is to graduate a sufficient number of pilots at a rate adequate to meet USAF FTU pipeline requirements as well as ensuring adequate pilot production is maintained to sustain operational unit requirements. Although the definition states Pilot Throughput is independent of the T-38 FoS capabilities, the analysis team wanted to capture Cockpit Anthropometric Accommodation. The T-38 aircraft limits the population of potential pilots. Source: United States Air Force Advanced Pilot Training Family of Systems Analysis of Alternatives Update Final Report, 21 August 2014, Version 3.0. Document is For Official Use Only. Requests for source document copy must be referred to AETC/A5RX, Randolph Air Force Base, Texas, 78148. U.S. Air Force, "19th AF activates under AETC," September 29, 2014, at http://www.af.mil/News/ArticleDisplay/tabid/223/Article/502946/19th-af-activates-under-aetc.aspx. U.S. Air Force, "T-6A Texan II," March 28, 2003, at http://www.af.mil/AboutUs/FactSheets/Display/tabid/224/Article/104548/t-6a-texan-ii.aspx. Airforce-Technology.com, "T-1 Jayhawk Trainer Aircraft, United States of America," at http://www.airforce-technology.com/projects/t1-jayhawk/. U.S. Air Force, "T-1A Jayhawk," September 14, 2005, at http://www.af.mil/AboutUs/FactSheets/Display/tabid/224/Article/104542/t-1a-jayhawk.aspx. U.S. Air Force, "T-38 Talon", September 23, 2005, at http://www.af.mil/AboutUs/FactSheets/Display/tabid/224/Article/104569/t-38-talon.aspx. A "glass cockpit" replaces traditional dials and gauges that display aircraft information with screens that replicate such gauges and can be reprogrammed to simulate various aircraft's cockpits. Air Force-Technology.com, "T-38 Talon Twin-Jet Trainer Aircraft, United States of America", at http://www.airforce-technology.com/projects/t-38/. Flightglobal, "Boeing wins 10-year T-38C contract as USAF looks to T-X", January 5, 2016, at https://www.flightglobal.com/news/articles/boeing-wins-10-year-t-38c-contract-as-usaf-looks-to-420533/. Email communication with Maj. Joseph Clapsaddle, Trainer Program Element Monitor, Global Reach Directorate, Secretary of the Air Force for Acquisition, March 7, 2017. U.S. Air Force, "T-38 Talon Fact Sheet," May, 2, 2008 at https://web.archive.org/web/20130801121407/http:/www.af.mil/information/factsheets/factsheet.asp?id=126. Air Education and Training Command, "Advanced Pilot Training (APT T-X) Concept of Operations," at https://www.fbo.gov/utils/view?id=99751ca4edfc3d8c6260cb6a65f62276. CJCSI 3170.01, January, 23, 2015, at https://dap.dau.mil/policy/Documents/2015/CJCSI_3170_01I.pdf. Angle of attack is defined by Britannica as the angle of the aircraft wings relative to the wind or oncoming flow. According to NASA analysts, modern fighter aircraft that can maintain controlled flight at high angles of attack provide the fighter pilot the ability to turn rapidly and enhance his or her nose-pointing capability, forming the basis for superior handling qualities. For more detailed information see NASA Technical Memorandum 104322 at https://www.nasa.gov/centers/dryden/pdf/88437main_H-2128.pdf. Air Education and Training Command, "Advanced Pilot Training (APT T-X) Concept of Operations," at https://www.fbo.gov/utils/view?id=99751ca4edfc3d8c6260cb6a65f62276. CRS has been unable to find views dissenting from AETC assertions. Ibid. Advanced Cockpit/Crew Resource Management means the ability to prioritize mission tasks and operate on-board sensors and systems to maximize situational awareness and mission effectiveness. FedBizOpps.gov, "Request For Information FBO Notice," March 17, 2015, at https://www.fbo.gov/utils/view?id=1d96db580a132adaaed1961d2f64dcf3. FedBizOpps.gov is a single government point of entry for Federal government procurement opportunities that exceed $25,000. Government buying agents can publicize their business opportunities by posting information directly on the site. Vendors seeking Federal markets for their products and services can search for opportunities solicited by Federal contracting agencies. The portal can provide transparency when communicating with potential vendors and ensure all interested parties have access to the same information. FedBizOpps.gov, "Draft RFP," July 2016, at https://www.fbo.gov/?tab=documents&tabmode=form&subtab=core&tabid=9143b12ef30590a154ed155e427fe784. FedBizOpps.gov, "Updated Draft RFP," Sep 2016, at https://www.fbo.gov/?tab=documents&tabmode=form&subtab=core&tabid=73ec7b43fdfb914eed96078b65d1150a. FedBizOpps.gov, "Final Solicitation RFP," Dec 2016, at https://www.fbo.gov/?tab=documents&tabmode=form&subtab=core&tabid=ce37a15c1aa4f8d81a60ea2e88ed63d9. FedBizOpps.gov, "RFP Model Contract Sections A-M," December 30, 2016, at https://www.fbo.gov/utils/view?id=c9c098127f89fa2e70a83d6a88bbaf27. For further details on contract specifics see the RFP Model Contract at https://www.fbo.gov/utils/view?id=c9c098127f89fa2e70a83d6a88bbaf27. Schweizer, Roman, Competition Catalysts: T-X Field Tightens Ahead of March Bid Due Date, Cowen Washington Research Group Policy Note, January 30, 2017, at https://cowen.bluematrix. [email address scrubbed]&source=mail. FedBizOpps.gov, "Solicitation FA8617-17-6219, Section J – Attachment 18, Section M – Evaluation Factors for Award," December 30, 2016, at https://www.fbo.gov/utils/view?id=d90ec3750a14ef0886e67ec289f84095. For additional information on the KC-X program, see CRS Report RL34398, Air Force KC-46A Tanker Aircraft Program, by [author name scrubbed]. The Affordability Gate is a cost cap on the total contract value of the vendor's offer. In order to be considered as an awardable offer the contract value must be less than or equal to $16.3B. FedBizOpps.gov, "Solicitation FA8617-17-6219, Section J–Attachment 17, Section L–Instructions, Conditions, and Notices to Offerors," December 30, 2016, at https://www.fbo.gov/utils/view?id=ce217c3f392a69eac7c0d7b7d16ac2dc. Air Force News Service, Air Force awards next-generation fighter and bomber trainer, Arlington, VA, September 27, 2018, https://www.af.mil/News/Article-Display/Article/1647147/air-force-awards-next-generation-fighter-and-bomber-trainer/. Weisgerber, Marcus, A New Military Jet Flies Just One Year After It Was Designed, Defense One, December 20, 2016, at http://www.defenseone.com/business/2016/12/new-military-jet-flies-just-one-year-after-it-was-designed/134065/?oref=gbb-newsletter. Weisgerber, Marcus, Northrop Secretly Building Jet for Air Force Trainer Competition, Defense One, February 6, 2015, at http://www.defenseone.com/technology/2015/02/northrop-secretly-building-jet-air-force-trainer-competition/104739/. Jennings, Gareth, Northrop Grumman's T-X Design Breaks Cover, IHS Jane's Defence Weekly, August 22, 2016, at http://www.janes.com/article/63129/northrop-grumman-s-t-x-design-breaks-cover. Insinna, Valerie and Mehta, Aaron, Northrop Grumman Drops Out of T-X Trainer Competition, Defense News, February 1, 2017, http://www.defensenews.com/articles/northrop-grumman-drops-out-of-t-x-trainer-competition. Malenic, Maria, Lockheed Martin flies first T-50A aimed at USAF T-X competition, IHS Jane's Defence Weekly, June 3, 2016, at http://www.janes.com/article/60936/lockheed-martin-flies-first-t-50a-aimed-at-usaf-t-x-competition. Ryall, Julian, South Korea's T-50 clocks up 5,000 test flights, IHS Jane's Defence Weekly, November 28, 2016, at http://www.janes.com/article/65793/south-korea-s-t-50-clocks-up-5-000-test-flights. Insinna, Valeria and Mehta Aaron, Raytheon, Leonardo End partnership for T-X Trainer Program, Defense News, January 25, 2017, http://www.defensenews.com/articles/raytheon-leonardo-end-partnership-for-t-x-trainer-program. Drew, James, Sierra Nevada Corp., TAI Team To Offer Freedom Trainer For T-X, Aviation Week, December 16, 2016. http://aviationweek.com/defense/sierra-nevada-corp-tai-team-offer-freedom-trainer-t-x. The whole person concept considers the individual's performance, leadership potential, breadth of experience, job responsibility, professional competence, specific achievements, and education. Carretta, Thomas, "US Air Force Pilot Selection and Training Methods," 2000, at http://www.dtic.mil/cgi-bin/GetTRDoc?AD=ADA430320. Baseops.net, "Test of Basic Aviation Skills," at https://www.baseops.net/militarypilot/tbas.html. Baseops.net, "Specialized Undergraduate Pilot Training," at https://www.baseops.net/militarypilot. Doss Aviation IFT website, "USAF Initial Flight Training," at http://www.dossaviation.com/usaf-ift. Air Education & Training Command, "Advanced Pilot Training (APT T-X) Concept of Operations," at https://www.fbo.gov/utils/view?id=99751ca4edfc3d8c6260cb6a65f62276. Baseops.net, "Euro-NATO Joint Jet Pilot Training," at https://www.baseops.net/militarypilot/enjjpt.html. USAF Air Education & Training Command, "Advanced Pilot Training (APT T-X) Concept of Operations" at https://www.fbo.gov/utils/view?id=99751ca4edfc3d8c6260cb6a65f62276. Andrews, Dee H. and Carroll, Lynn A., "R&D Advances in USAF Pilot Training," September 1996, at https://www.researchgate.net/publication/235193358_RD_Advances_in_USAF_Pilot_Training. Fifth-generation aircraft incorporate the most modern technology and are considered to be more capable and advanced than earlier generation aircraft. Tegler, Eric, "Air Force Flight Simulators May Help Cut Training Costs, Defense Media Network," at http://www.defensemedianetwork.com/stories/virtual-bargain/. CRS was not able to confirm if the 60/40 percent live flight/simulator split was accomplished by 2013. Tegler, Eric, "Air Force Flight Simulators May Help Cut Training Costs, Defense Media Network," at http://www.defensemedianetwork.com/stories/virtual-bargain/, p. 1. EINPresswire.com, "Flight simulator market to Grow at CAGR of 4.5% According to Forecast from 2017 to 2022," April 27, 2017, at http://brazilbusiness.einnews.com/pr_news/378150197/flight-simulator-market-to-grow-at-cagr-of-4-5-according-to-forecast-from-2017-to-2022. Croft, John, "U.S. Navy Expanding Simulator Use to Cut Costs," December 2, 2013, at http://aviationweek.com/awin/us-navy-expanding-simulator-use-cut-costs. The requested funding is found in the Air Force's research, development, test and evaluation (RDT&E) account in program element (PE) 0605223F, Advanced Pilot Training.